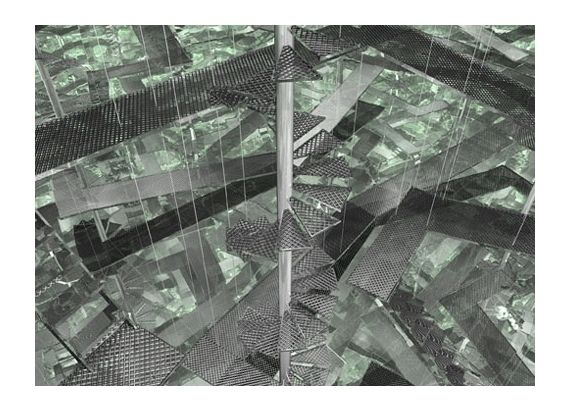 Ana Maria Tavares is known for installations employing materials such as steel, glass and mirrors. Resembling architectural structures, her installations call to mind the artificial, emotionally vacuous atmosphere of airports, office buildings, and other forms of urban architecture. Through her re-deployment of industrial architectural materials, such materials lose their function, and viewers are subtly thrown off balance in their physical experience and sense of time. Recently, Tavares has been creating films in which steel columns connect with stairways running in all directions. By introducing reflections she renders the space in the films all the more complex. Airshaft (to Piranesi) (2008) examines the realities of human circulation through anonymous urban spaces as found all over the world. The video depicts a modern architectural space in the manner of the complex, labyrinthine expanses depicted by the 18th century Italian artist Piranesi, but wavering fluidly like a mirage. The chaos of Brazil’s enormous urban spaces is reflected here. Tavares’s videos produce an encounter with “somewhere” that is not quite “here” and make us aware of how unreal our reality can be. -- FROM THE ARTIST DESCRIPTION FOR "WHEN LIVES BECOME FORM: CONTEMPORARY BRAZILIAN ART, 1960S TO THE PRESENT"